Milwaukee coffee workers fight to make history with union drive | Fight Back! 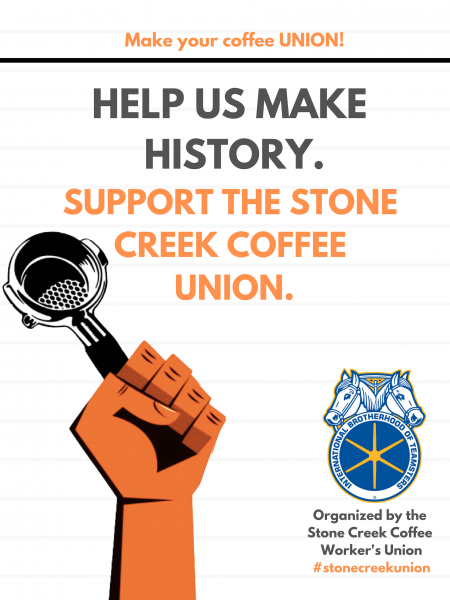 Milwaukee, WI - Workers at Milwaukee's Stone Creek Coffee unveiled a petition drive, March 4, to support a several months’ long organizing drive at retail shops and production facilities. These young cafe baristas, cooks, bakers, warehouse workers and truck drivers have signed up in ever-growing numbers to be represented by Teamsters Local 344, the Sales and Service Industry union that represents UPS workers as well as Coke, Pepsi and bakery and linen companies in southeastern Wisconsin. Maria Brondino, the recording secretary of the organizing committee and one of the longest-serving members, said, "We are forming a union because we want an equal voice in our workplace. We believe the best way to achieve this lasting change is through a collective voice." These workers, overwhelmingly women and nearly all in their 20s or early 30s, are part of a rising movement of young people looking to join unions and fight for higher wages, better benefits and working conditions. Last summer, the Pew Research foundation published evidence that showed that 68% of all people age 18-29 view unions more favorably than corporations. Kellie Lutz, the chairperson of Teamsters Local 344's Milwaukee Coffee Workers Organizing Committee, said of the effort, "This effort comes from every corner of the company, every location, and every type of job. We are excited, energized and ready to negotiate as equals at Stone Creek." When these young workers succeed, they will be only the second unionized retail coffee company in the United States, and the first of its kind in Wisconsin. As workers look to find ways to fight back against stagnant wages and declining working conditions, organizing efforts of this kind light the way to a brighter future.